100% Cotton Military Shemagh Arab Tactical Desert Keffiyeh Scarf Wrap for Women Men 43"x43" | What Should I Say? 1.The Shemagh, also known as The Keffiyeh or Arab Scarf. 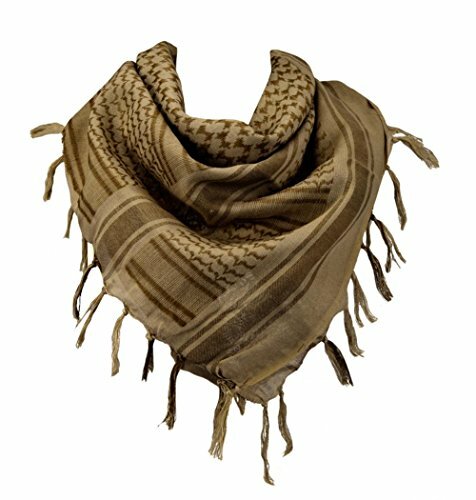 starting its road to success as a scarf worn in the Middle East to protect people from dust, Now is widely used in outdoor tactics. 2.Thickened cotton material makes scarf soft and cozyï¼Protecting you from sunlight and dust in summer and keeping you warm in winter. 3.Suited for all kinds of conditions,including outdoor cycling, hiking,hunting and skiing etc. 4.hand washing and air drying recommended .extending the life of the Shemagh. 1.Please allow 1-2cm dimension deviation. 2.Slightly color difference allowed for light effects. 1.Make a triangle out of your shemagh. 2.Cover your forehead with the folded edge, placing it in the middle of your forehead and making sure that the ends are equal both left and right. 3.Place the right side of the shemagh under the chin, by taking its end towards your left side and over the left shoulder. Hold it steady with your left hand. 4.Place the left side of the shemagh over your face, by using your right hand and pulling it to your right. Make sure both your nose and mouth are covered. 5.Secure the two ends with a knot behind your head. Make sure the knot is pretty tight, so that the keffiyeh doesnât fall from your nose. However, it shouldnât be too tight because you might still want to breathe. 6.Make the required modifications to suit you better. If you donât need to cover your mouth and nose, but just your head, pull the lower part down. If you donât need to cover your head either, pull the top part down too and you get a nice looking scarf. 100% Cottonï¼making scarves comfortable, breathable, warm. Scarf measures approximately 43"x43"ï¼weighs 180g. Special processing makes the Shemagh not fade.âNon-defrmation. If you have any questions about this product by VOCHIC, contact us by completing and submitting the form below. If you are looking for a specif part number, please include it with your message.